Daily Distractions: Farewell, Shawn Tolleson. At some point the Dodgers will add to their major-league roster this off-season. For now at least, the Dodgers continue to clear room. Reliever Shawn Tolleson was claimed off waivers by the Texas Rangers on Tuesday, leaving the 40-man roster at 31. Tolleson’s 2013 season was sabotaged by injury. He appeared in one game in April, but couldn’t sleep following the game because of an intense pain his back. Later that month, he had season-ending back surgery. The Dodgers had to replace his innings somehow, and right-handers Chris Withrow, Jose Dominguez and, later, Carlos Marmol and Brian Wilson, all held down the fort. That was apparently enough for the Dodgers to feel comfortable about cutting ties with the 25-year-old, who not long ago was chosen as the organization’s minor-league pitcher of the year. In 40 games in 2012, Tolleson went 3-1 with a 4.30 ERA, striking out 39 batters in 37 &frac23; innings. According to the Arizona Fall League’s Twitter account, the Dodgers added pitchers Onelki Garcia, Mike Thomas, Yimi Garcia and Shawn Tolleson to their AFL roster. The Dodgers announced their preliminary AFL roster on Aug. 27, including four “pitchers to be named later.” The AFL begins play on Oct. 8, so today’s announcement has no bearing on Garcia’s current status with the Dodgers. Garcia has appeared in two games since being recalled from Triple-A Albuquerque on Sept. 11. Manager Don Mattingly said at the time that Garcia didn’t figure to make the Dodgers’ postseason roster. Tolleson is recovering from back surgery and a torn muscle and has only appeared in one game this season. Thomas, a left-handed reliever, and Garcia, a right-handed reliever, both finished the season at Double-A Chattanooga. 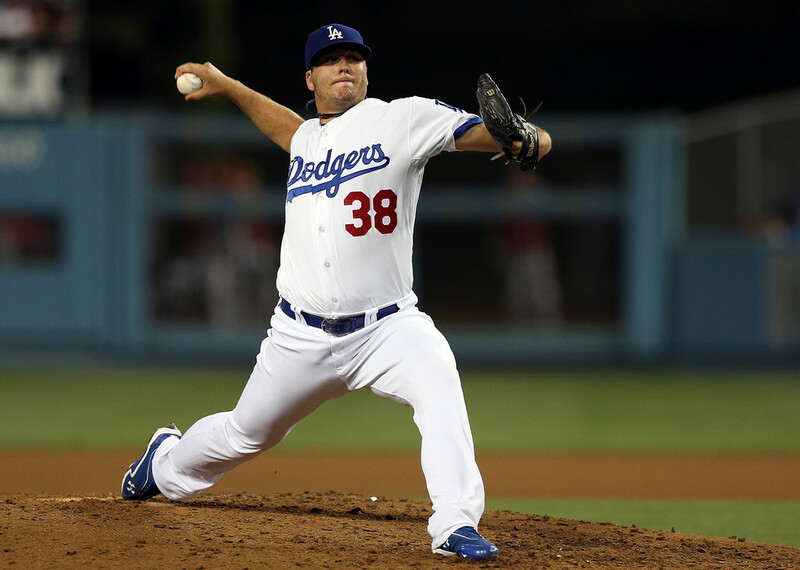 Dodgers pitcher Shawn Tolleson to resume throwing tomorrow. Dodgers pitcher Shawn Tolleson, who had back surgery in April, has been cleared to resume a throwing program tomorrow. Tolleson will travel to the Dodgers’ Camelback Ranch facility in Glendale, Ariz. to begin the rehab program. He is targeting an August return. The 25-year-old right hander appeared in one game this season on April 12 before going on the disabled list due to back spasms. Shawn Tolleson has back surgery, out 3-5 months. Shawn Tolleson‘s time on the Dodgers’ active roster was brief but costly. Tolleson is scheduled to undergo back surgery today to repair a herniated disc in his lower back. The procedure will be performed by Dr. Robert Watkins in Los Angeles. He is expected to return to competition in 3-5 months. Tolleson started experiencing back stiffness after a rough travel day prior to his first and only appearance for the Dodgers on April 13. He received an epidural injection three days later and was placed on the 15-day disabled list. With today’s news, Tolleson could be transfered to the 60-day disabled list to open a spot on the 40-man roster if the Dodgers need it. The news comes on the same day that Chad Billingsley had Tommy John surgery on his right elbow. Why Dodgers pitcher Shawn Tolleson spent Friday night on his hotel room floor. Shawn Tolleson pitched an inning Thursday afternoon in Albuquerque, New Mexico. That night, he and the Isotopes flew into Des Moines to play the Triple-A Iowa Cubs. Friday morning, the Dodgers called up Tolleson to pitch in that night’s game in Phoenix, Arizona. “I had a crazy travel day,” he said. Along the way, Tolleson’s lower back stiffened up. The adrenaline got him through 11 pitches against the Diamondbacks — he walked both batters he faced — but it couldn’t mask the pain in his back at night.